When we finally pulled away from Addison, my heart was in tatters but it was time to go. We left Mom waving in the yard, and thru a haze of tears I started looking up possible campsites for the night, as we’d not made any reservations anywhere. By the time we hit the quarry on I94, I got someone to pick up the phone at a campground near the Indiana Dunes, and felt the knot in my stomach begin to settle. We had a destination. This wandering thing has put an interesting twist on my routine-loving heart. I like order, simplicity, and thinking ahead so I can plan the most efficient way to get it done … leaving me more time to relax. I grew on up travel of all sorts, from visiting the backcountry of Peru and Bolivia by bus and open truck, to road tripping across the US curled up on a home-rigged platform in the back of my folk’s 4-cylinder minivan, tents and camping gear stowed underneath me. Any trip that was not designated as a sight-seeing one was executed in the most direct manner possible. Stops were as short and infrequent as we could manage, and when we were young they were bypassed entirely if it was just one of us kids needing to pee, we had a can for that in the back. Spending time at the destination was the goal, not meandering our way there. We always knew who and what was waiting at the other end. This trip has very little of that going on, though we sometimes know who and what are at the next stop. That’s good for my detail-loving side, as it lets me plan enough to get the necessary stuff out of the way whenever there’s a chance. Phone calls, laundry, blogging, photo processing, grocery shopping, schooling, camper organizing (Fynn keeps collecting things, and we can’t seem to turn down books … ), and trying to plot a somewhat logical course that keeps us from spending a bajillion bucks on gas. I like things planned. So that knot in my heart when we left Addison wasn’t just saying goodbye to my folks for I-don’t-know-how-long, it was also the unease over finding a place to spend the night that wasn’t a truck stop or a rest area, which don’t generally lead to restful sleep. I’m slowly learning to roll with it a little better though, and as we just got a 2nd battery hooked up to the camper we have more ability to spend a night or two not hooked up to anything, which really increases our options. It widens the “what’s next” pool hugely, and that helps me a lot. So back to heading towards the Dunes … we found our site, settled in, and took a deep breath. Just the 4 of us again, wheee! We took a day to go to the beach, and after finding it crowded and hot we climbed up some dunes and the boys played The Game (something Douglas invented while we were in Chicago, involving found-object-fortress-building and warfare, medieval style) while I vegged in the shade and watched people and waves, two of my favorite past times. One more night and I was almost starting to relax … but it was time to go. We were working against the deadline of Michael starting a Sol LeWitt installation job in New Haven CT on August 3rd, something we committed to back when we were still in TN. So we wanted to fit in some work that logically fell in between Chicago and CT. A lot of ground, and only 10 days available between the two. Our next stop was at Gary and Peggy Nielsen’s, who call Holland Michigan home, and Peggy just happens to be the sister of John Kaiser, whose cupola we had just built. She’d contacted me several months before with a lovely email, and the mention of a couple projects that they’d like to have done if we had the time. So we pulled into their gloriously double-wide driveway on Saturday evening, and did a quick setup before being taken out for a yummy dinner. Their kids are all grown and the grandkids are multiplying rapidly (Mark! Abby! xoxo), so they fill their “free” time with work in Moldova with university students via Intervarsity and their own organization called Second Fiddle Ministries. They don’t exactly act retired, and seem to be masters of giving people wings and hope. The two projects offered were some calligraphy on the dining room wall, and a fountain/waterfall feature in the middle of one of Peggy’s lovely gardens. We opted to start with the waterfall, and were given some guidelines as to how it should sound, an idea of the desired height, and some images of styles that they were drawn to. We did some measuring, some thinking, and a bit of sketching. Then we just kind of dove in … it seems hard to do anything else when you’re working with stone. A trip to Home Depot netted us a small pond liner that we buried to ground level to act as our water source, and it also had three built in stands for water plants, which we thought worked well as a sturdy base to build on. In order to bury it, we had to remove a few plants. A very few actually, as Peggy’s hosta plants were the most humongous ones I’ve ever seen, and I think I measured the one we took out at 5’ in diameter. It was remarkably easy digging, given that they live just a couple miles from the shore of lake Michigan, so the soil there is still very sandy. We hoped to leave the other plants around the structure, so kept what we removed to a bare minimum, and did our best not to trample too much getting in and out. Next, we drove most of the way over to Grand Rapids in Matilda, on a very hot day, to visit the closest stoneyard we could find. Given that it was an hour away, we thought we better get everything we needed in one trip, and knew we needed to keep it economical. We’d brought the pond liner along for size, and basically started building up a possible fountain structure right in the middle of the stone piles, in order to know what to buy. The boys found the only shade on the property, invented a few games, got hot and bothered, and started raiding the water cooler in the office. 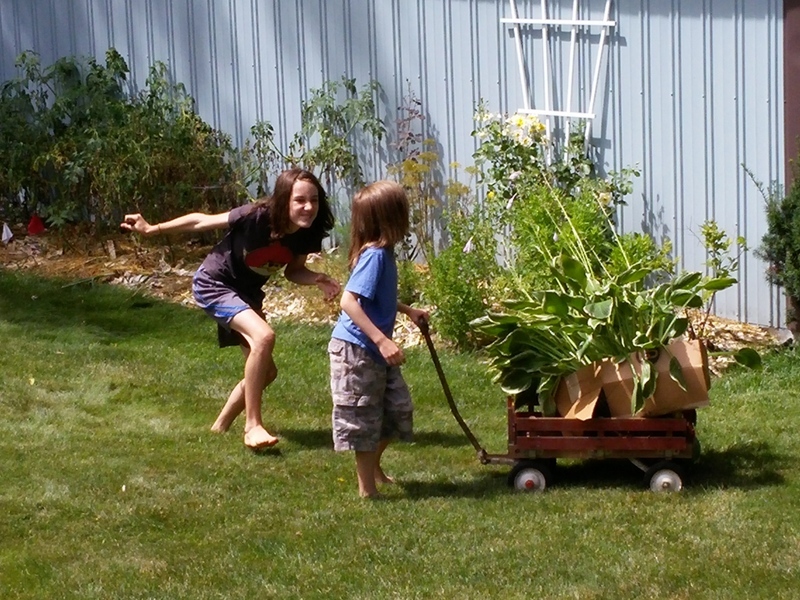 We kept hauling and building and rearranging and weighing our piles, sweating buckets in the sun. After something like 3 hours, we threw in a few more stones for good measure, tallied up our scribbled sheet of weights and stone types, and trudged into the office. The man who’d helped us at first was as shy as they come, and had long ago stopped offering help, seeing that we were going to be awhile. His brother in the office was a bit chattier, and gladly accepted our tally sheet in lieu of weighing anything themselves, and so we scooted back to Gary and Peggy’s as fast as possible, knowing we were supposed to be ready to be taken out on a boat in Lake Michigan after dinner that night by one of their neighbors, named Doug. We decimated Peggy’s taco bar, grabbed suits and life jackets for the boys (who’d been promised a swim) and headed for the marina. Parking Matilda in the private hangar there for members was a bit of a hoot, she was certainly the oldest matron in the place, as well as the only one with a backend full of 900+ pounds of rock. There were still a good 2 hours till sunset, and the plan was to tour Holland’s Lake Macatawa a bit, and then head out into Lake Michigan to catch the last rays of the day. We saw all kinds of fancy homes, and then headed out towards the sun. Felt a familiar pang when watching all the folks on the end of the piers, as they watched us heading out … guilty pleasure at being the one On the boat this time, rather than watching from shore. Guilty as I’d envied the boat dwellers more times than I could remember, but still enjoying it to the hilt. The boys jumped in after awhile, got nicely chilled, and were wrapped in multiple towels when they climbed back in after a bit of swimming. First though, Douglas was sent out maybe 50 yards from the boat to retrieve something we saw floating there, as I thought it might be a good choice for our Michigan memento … we’ve started collecting some small natural object from every place we visit, with the intention of building it into our house when we get to that part of the plan. After hauling in what turned out to be a little piece of broken mast/driftwood, we had a good laugh … stuck to it was a tiny “made in China” sticker! It obviously had just adhered to it in the water somehow, but made it rather amusing nonetheless. We sucked in every last drop of the sun, doing nothing but watch its dive towards the horizon, reveling in the colors, the quiet, and the peace of lapping water and no other agenda but enjoying the beauty. We all needed it I think. A truly perfect evening. The next morning we unloaded stones, set the boys to scrubbing and washing them, and started stacking. Many configurations later, we felt like we had a good tower going, and started running the pump hose up the back side so we could test the waterflow. It turned out to be way too strong, tending to splatter well beyond the perimeter of our little 3 foot pond. We called it quits for the night, to “think on it”, and tore it down and started over the next morning. Another day of building and playing got us to a better solution, which included drilling through one rock to make the flow come up underneath a capstone and be diffused a bit that way. We chose the haphazard pile approach, wanting to make it produce a variety of sounds, be visible over the hostas and lilies in the summer, and look good for a full 220 degrees of viewing angle given its mid-garden placement. The next day we fiddled a lot with stones to hide the hose up the back, filled in some corners with marine foam just to make sure things weren’t going to shift around in a Michigan winter, and somewhere late in the process heard a little crack/click sound that we managed to write off as the basin doing a little settling. Of course that’s all it was. We put the finishing touches on the edging and blending into the surrounding plants, and had the big sound test, which gave Gary a sound close enough to what he wanted to declare it “Right on!”. We went to bed tired, about 70% happy with what we’d accomplished, and planning to pull out by noon the next day ... Friday morning. CT minus 3 days. I wanted to be happier about it, but felt it wasn’t quite up to par. Something was just a bit off. You probably saw this coming a mile away, but the next morning I checked out the fountain on my way into the house, and my heart sank to my toes. The water level had dropped significantly overnight, and the fountain hadn’t even been running. Aaaargh! We broke the news to Gary and Peggy over breakfast, and said we’d stay to fix it. Somehow. They were incredibly gracious about it, and said we were welcome to come back some other time and work it over, but we really wanted to avoid having that big question mark hanging over our heads. Having raised 6 kids, they are masters of knowing when to hold ‘em, and when to fold ‘em, when to walk away, and when to run … they have patience, insight, steadiness, and humor in spades, as well as a quiet undercurrent of love that keeps them humming along side by side, each doing what they do best. Given that the pile was already adhered together, we couldn’t exactly lift 900 lbs to find and fix what we now knew must be a crack in the basin. Sand doesn’t support things the same way dirt does, and we hadn’t accounted for that. Praying and plotting netted us the plan to fill the basin up with concrete to the three little stands, on which we’d rested the biggest base stone. We ran to Home Depot again, found an angel in the concrete aisle who knew the properties of every single one of the 20 types they had, told us which one to get (not the one we’d already lugged onto the cart) and explained how it wouldn’t completely solve our problem, but would help it significantly. Back at the house we dismantled all the stones around the base, and just for kicks I lay down on my side and reached back under the base stone and traced where it met the plastic with my fingertips. I couldn’t reach it all, but just as I came to the end of what I could touch, I found the very edge of a tiny crack. Score!! Having been told that concrete won’t really adhere to plastic, Michael grabbed the boys’ fimo collection, and I went to work sealing as much of the perimeter of that stone/base junction as I could, willing my claustrophobia to stay away. Buried up to my shoulder under a pile of stone, with my face inches from it and my arm contorted crazily, I wasn’t terribly comfortable. It worked much better to keep my eyes closed. Funny, that’s true for a lot of things. Gary and Peggy packed for a weekend away with friends (planned long before), while we used contractor bags with the corners cut off as giant frosting tubes, squeezing mixed cement down into the three small openings we had into the pond area underneath our base stone. It took all four of us, and the boys really pulled their weight. A bit of a race against the clock. We filled up to the base stone, and then let it start to set while we cleaned up everything. Once it was getting stiff, we scooped out a hollow in the back section where the pump was to rest, hoping to leave enough volume of water in the basin to keep up with the pump. We knew it was going to be really close. We waved Gary and Peggy off on their trip, and then put back all the surrounding stones, spread more pebbles, and took some final pictures in a lovely Friday night sunset, praying that it would be a workable fountain once the concrete cured. We couldn’t stay around to find out. Gary promised that he’d give us a full report once they got back home, and word is that it works well and sounds good, though the water flow is a wee bit lower than before. A relief, though a bit of regret. We learn something every time, that’s for sure. Not just about stone and construction and how to work together, but about human nature and people and hearts and lives and the brokenness and beauty that is in every single person we meet. Some triumphantly flying, some humming, some limping, but all moving forward. All loved. All with something to teach us, show us, or shower on us. Willing to let us in, trust us, and share whatever they have. Gary and Peggy were no exception, and gave us far more than they likely realize. Beautiful, humbling, and loved, they are … thanks you two, for everything!